Grilled Halloumi with Fresh figs, honey and mint is an amazing appetizer and the combination of sweet with salty will mesmerize you. It’s not a coincidence that in Cyprus we love pairing watermelon with halloumi! I’ve been away from blogging and the social media for a month and if it wasn’t for my blog’s anniversary I would still need some time to rest, as I’ve been quite busy lately. When I started blogging in 2007, I never imagined that this new hobby of mine would bring me so far. As my readers already know, I’ve already published two cookbooks and now I am doing cooking classes in Nafplion. I hope to continue blogging for many more years but with my new occupation, I might not blog that often, especially during the summer months which are the busiest. I will do my best to post at least twice a month. It would be easier just to post a recipe with one photo and skip all the introductory part and taking many photos, uploading and editing, which takes a lot of time (multiplied by 2, as I also post on my Greek blog). I might try this and see how it goes. I’ve attempted a few times during August to write a post but I was feeling so tired, both physically and mentally that I quit as soon as I started. There’s been a lot of cooking going on but I wasn’t in the mood of taking many pictures, uploading them and most of all posting about them. 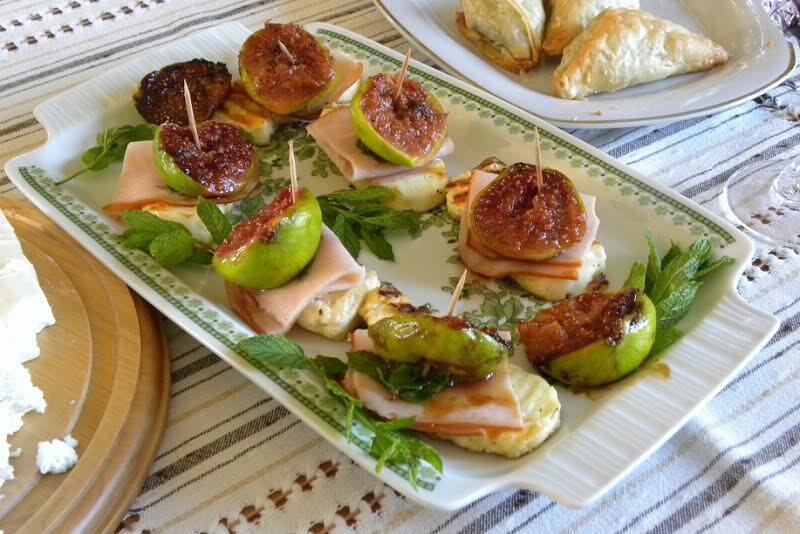 Since the fig season is just beginning here in Greece, I decided to post this appetizer which I made last year and those who tried it were raving about it. I’ve made them many times and tested them using a cast iron griddle, a non-stick frying pan and grilled them in the oven. My first choice is the cast iron griddle, but you can make them using any of the above methods, but they do look better with the grill marks on the halloumi. Of course it would be even better to grill them on the BBQ but with the high temperatures we are having, this is out of the question. Grilled halloumi, especially over coals, is amazing by itself and figs are among my favourite summer fruit. When grilled, with the help of a little honey, they caramelize and the addition of mint pairs so well, making them taste out of this world. These make great appetizers, as starters΄for parties, receptions, etc. Besides being simple to make, they take barely any time at all, so you can make as many or as little as you want. A very simple concoction which is so easy to make but the combination is so delicious. Heat the olive oil in a cast iron griddle or non-stick frying pan and grill halloumi on both sides. Wash the figs and cut them in the middle leaving the skin on. Grill the figs for a few minutes, on the side of the skin first. Brush them with the honey and then turn them over and cook for a few minutes until they caramelize. Use a small skewer or toothpick to take half a fig, a leaf of mint, ½ slice of smoked turkey, folded in the middle and a slice of halloumi and put it in a plate with halloumi being on the bottom. These appetizers look beautiful and delicious. A great combination and delicious appetiser. Wow! Its a great combination and delicious appetiser. I love it so much. Thanks for sharing it.